As a thank you to all my loyal friends for helping me reach 500 followers, JEWELIQ is graciously offering a reader's choice item from their store. Yes, that's right, one lucky lady will have the opportunity to pick their favorite piece of jewelry from their impressive selection. They even offer the famous Blogger Bubble necklace that everyone and their mother is lusting over. JEWELIQ knows what it feels like to be on a hunt for that perfect statement necklace, pair of earrings or an addition to your arm party, only to be disappointed by the high price in the end. Let me warn you, the winner is going to have a tough time choosing their fave! I already have a wishlist 10 items long! All you have to do is follow the Rafflecopter prompts and you are well on your way! Please be honest! I will verify entries. Giveaway will end at 12:00 AM CST on Thursday, July 26th. Winner will be announced Friday, July 27th. Valid for U.S. residents only. I am also over at Angela's blog today, Head to Toe Chic. Come over and see me. I will tell you why you should Keep It Simple, Sister. Cheers, thank you for reading and good luck! i love the fiji bauble necklace! so hard to choose! probably strawberry milkshake.. coral dream.. or toffee! toooouuuughhh choice. I think the chevron stack bracelets, though. I am loving the POPEYE earrings...gasp! I am a sucker for nautical stuff! Love that bubble necklace! Congrats on your fabulous blog, Shanna! I would either choose the bubble gum bib or the noir baubles! 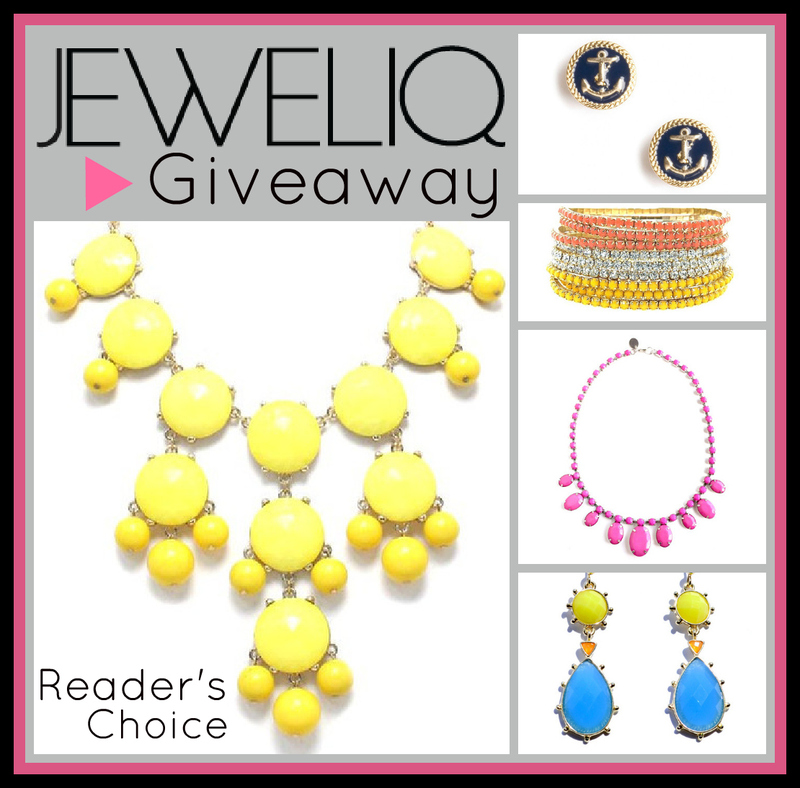 If I won I'd totally pick the blogger bubble necklace in a fun color! love them all!!! The Panna Cotta necklace is gorgeous!! So many things I love! I especially like the Sienna bracelet! I LOVE your blog and I LOVE this giveaway!!! Oops hit enter too quickly but love the blogger necklace! I love the clear shadows necklace. I NNNNNEEEEEEEED a statement necklace! EEEEEK! Thanks for the giveaway! The "strawberry milkshake" would have to be my pick!! I love a statement necklace!! I'd get the Strawberry Mojito necklace, so cute! Congrats on over 500 followers !!! Annnnnd bc I love my teal one so much I just might love the yellow bubble necklace best! LOVE baubles in general - I actually love the yellow bauble necklace right in the photo girl! Congrats on 500! Congrats on 500 followers and thanks for the giveaway. I love JewelIQ! The Coral Dream is gorg! Would love some new jewelry! Congrats on 500! ! love the Fiji Bauble Necklace! If you are absolutely forcing me to choose I choose the Leafy necklace. But I don't have to choose, I'll take one of everything! CHocolate disco bracelet! Loooooove it! I love the sky baubles necklace! You're right, it is hard to choose! I like the Noir Baubles and the Bubble Gum Bib! I would totally pick the Figi Baubles! Fun giveaway! If I don't win the other one, make sure I win this one, ok? Thanks love! I would choose the jade dream necklace. Love it. I love the chevron stack of bracelets and the Linda earrings! I love the leafy necklace! Love this site! I would choose A LOT of items...but I like the chevron bracelets! Oh my gosh there are so many that i would love to get.. I love the pave knot or even the coral dream or the dotti earrings! Awesome giveaway! I think I'd choose the bubble necklace! Fingers crossed! loving the Noir Baubles necklace ... of course, if I win, my choice could easily change. It's all so great! Wonderful ! I would choose the anchor earrings:) love them !!! Definitely a tough choice! The Jade Dream necklace is at the top of my list though! The avocado linked wrapped bracelet is my fav!! great giveaway shan! I would love the Noir Baubles! Great giveaway :) Love you and your blog! I sure do want that bauble necklace!! I hope I win! I already have one of those bauble necklaces... but I think I would pick another one! I would have a HARD time deciding! Mango Bauble! Love it!! Or the yellow one. You're right...if I won, I'd totally have a hard time deciding. Yikes! Oh my goodness gracious. I love everything. Especially the Sahara bracelet!!! I'm loving the yellow bubble necklace! The Pave disc is gorgeous! Congratulations! What a great giveaway! I'd choose either the strawberry milkshake or champagne drops....so hard to pick! I'd pick the Jade Necklace for sure! There's so many great things, it's hard to pick a fav! I think I would go with the mango baubles. Congrats on 500 followers! You rock lady! Fabulous giveaway - I have my eye on the Strawberry Mojito necklace! Fingers crossed! Really wanting a bubble necklace!!! I love the clover pastel bracelets. I love love love the "cross out" bracelet. I've been looking for one FOREVER!!! I love the rose triangle! Great giveaway girl!! I'm in LOVE with the Mango Baubles! I've been dying for one of these necklaces — just like you said! TOTALLY one of the bubble necklaces. GAH my fingers and toes are crossed, SO EXCITED! the popeye sailor earrings!! so cute! I love the sky bauble necklace!!! Really adore the Panna Cotta necklace! I would choose the sky baubles! I love those anchor earrings! So cute! I LOVE the necklace and the sailor earrings! Too cute! I looove the rose gold trio necklaces!! I would get the strawberry bobble necklace or the happy chain necklace. both are bright and would make a simple outfit pop! COngrats on 500 (and 43!) followers. I would love an orange bauble necklace for football season, Go Auburn! I love the clare bracelet! The fiji baubles necklace has my name written all over it! I love it all! Probably the Hot Pink necklace or even the anchor earring ;) I already have the bubble necklace - its the best! So much to choose from, but I think I love the Kildare clover necklace. So versatile! Way too much cute stuff, but I would definitely pick "The Perfect Chain"
I would love the snow queen bracelet .. its so gorgeous !!! I love them all!! I think i would pick one of the bauble necklaces, Lemmon or Noir! I love the Tangelo necklace! So gorgeous!! I love the Summer Burst earrings! So cheerful and fun. I would love a statement necklace like the blogger bubble necklace! Ooooh! Definitely entering the contest. I just adore the anchor earrings! I love the Saint Tropez bracelet!